Many golfers would jump at the chance to attend (who doesn’t like Disney World?) and yet don’t realize the Show has a serious purpose much less the scale of the industry, indeed its importance. In the U.S. golf has a $70 billion in economic impact, effects almost 2 million jobs and contributes more than $4 billion to charities each year. While there is certainly a “fun” aspect to the PGA Show it is above all a gathering of business people who understand the importance of education, networking and deal making. PGA and LPGA Professionals, retail buyers and credentialed industry members attend to see and be seen while investigating thousands of products and services on display by the 1,000 vendors exhibiting in the 1 million square feet of the Orange County Convention Center. Show week began on Tuesday January 23 with the world largest Demo Day comprised of 100 companies and 200 hitting bays spread around the 360-degree practice range of the Orange County National Golf Center. Day two saw opening of the exhibition on the Convention Center floor for the 40,000 plus attendees who took on the task of walking the almost 10 miles of aisles. They chipped and putted on artificial greens and hit the latest clubs in the 50-bay indoor Equipment Testing Center which was busy each day through close of the Show on Friday. In addition to all the golf orientated apparel, accessories, equipment, products and services the Show is a “major” for club professionals’ continuing education. Scheduled over the four days were 109 classes with topics that ran the gamut from teaching the teachers (“Pelvic Powerhouse-Considerations of the Pelvis in the Modern Day Golf Swing”) to pro shop operations (“Mark Down and Clearance Planning”). There were presentations, meet-and-greets and panel discussions with celebrities such as Blair O’Neal, Karrie Webb, Adam Scott, Dave Stockton, John Daly, Greg Norman, David Ledbetter and Hank Haney. Unscientific admittedly, and probably biased since those spending the money for travel, hotel and meals are likely to be those whose shops are doing fairly well…probably turning a profit. Shops not in that category are less likely to attend. Several of those queried said they were looking for increases in the number of rounds played and pro shop sales and almost everyone spoke of specific programs to attract more players. One private club professional said several thousand dollars was being spent to bring in new members. Programs to involve women such as nine-and-wine were often described, and many are starting or expanding group instruction sessions for juniors, women and seniors. Technology was a common theme as pros talked about how they could take players away from competing facilities and increase soft goods sales in their own shops. Also, often mentioned were more efficient ways to manage their tee sheets and getting a grasp of the latest club technology to better fit golfers with clubs. Neither manufacturers nor attendees responded with doom and gloom and certainly there were none of the negative responses heard just a few years ago. Equipment companies, especially Acushnet and Callaway Golf which are publicly-traded, are under pressure to grow sales. However, since the equipment “pie” is not growing due to the number of golfers at best being stagnate they must differentiate their products with advancements in materials and proprietary technology. The current market will not support even incremental price increases, so two strategies have emerged to expand sales opportunities. One, in addition to “regular-priced” clubs, is to go “up market” with higher priced models such as Callaway Golf did with the Epic Star driver by leveraging technology from their bestselling Epic driver. Priced at $700, the Epic Star is targeted at those with discretionary income and slower swing speeds which often translates into senior male golfers. Japanese brand Honma Golf, just now becoming known in America, has a similar plan for their top end premium quality BERES IS-06 driver series priced from $900 and $4,200. Tour Edge Golf chose the opposite strategy with their Hot Launch 3 family. All are of the highest quality and design but sell for prices at the lower end of the spectrum. As an example, the HL3 driver is $190 or roughly one-third to one-half that of competitors. In putters Cleveland Golf, a sister brand to Srixon and XXIO best known for their wedges, took a similar tactic with the Huntington Beach series. Wonderful design and construction but selling for $100 in contrast with other company’s flat sticks at two, three and four times the price. The success of one approach or both is an open question, but one thing is true for sure. Every company able to increase sales will be taking dollars from a competitor’s market share, not because more golfers are buying more clubs. 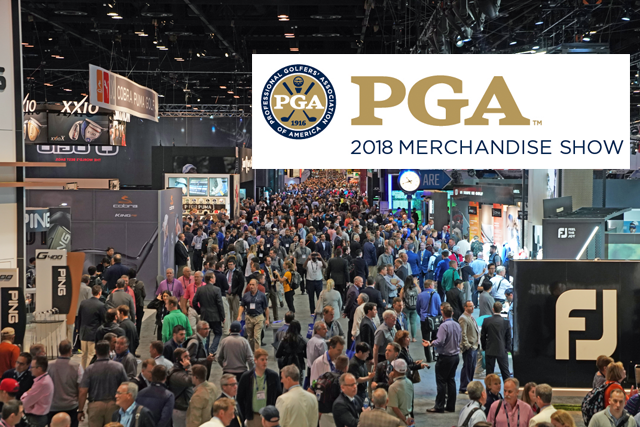 A summary of the 2018 PGA Merchandise Show would have to include what might be called cautious optimism from most of the attendees added to the fact real progress is being made in technology for equipment, teaching and club operations.